Harvey A. Andruss Library opened in 1998. Two Tiffany stained-glass windows are a centerpiece of the second floor and front facade of the building. Andruss is a 900 seat library with over 200 computers available for student use. It also includes 20-group study rooms, an exhibit room, meeting space, after-hours study room, and a Starbucks. 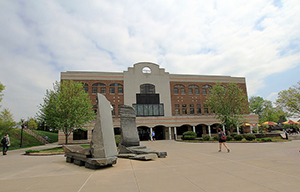 The original library was built in 1996 and remodeled in 2001 into the student services center. The current library is located on the site of the original women's softball field.